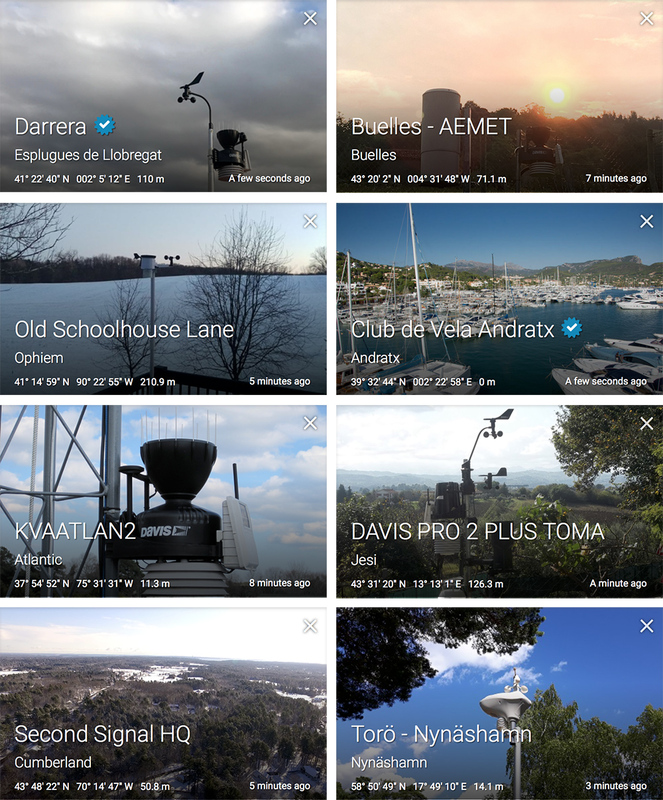 Welcome to Weathercloud Beta 7! This release comes with an all-new weather map based on OpenStreetMap instead of Google Maps. Our team has rebuilt everything from scratch to bring many significant improvements in design, usability and speed over the previous versions. The new map is also fully responsive for all screen sizes, so it doesn’t matter whether you are accessing Weathercloud from a computer, tablet or smartphone. The user experience is practically the same across all devices. Unlike all previous versions, in Beta 7 nearby stations are no longer grouped into clusters. We decided to get rid of them when we started working on the new map and realized that browsing without clusters was actually easier and quicker. Besides, don’t you think the map looks better without them? In addition to eliminating the clusters, we have replaced the bitmap markers used so far to represent both the personal and METAR devices on the map with a new vector version that looks crisp on high resolution screens. The small infobox with the main weather variables has been replaced by a full height, scrollable sidebox. This is an important step forward as we can now include far more information on each device without space constraints. Besides, we have added a useful button bar for quick access to different options that previously could not be accessed directly from the map page. We’re happy to see that more and more users are uploading beautiful pictures of their device or its surroundings, and we thought it would be a great idea to give them greater prominence with the new map. As a result, if you have uploaded a picture of your device, it will be displayed at the top of the new sidebox along with the basic profile information. If you have not yet uploaded a photo for your device, we encourage you to do so by going to the Devices page and clicking on Edit gallery in the Settings drop-down menu. Devices without a profile picture will show a default image. 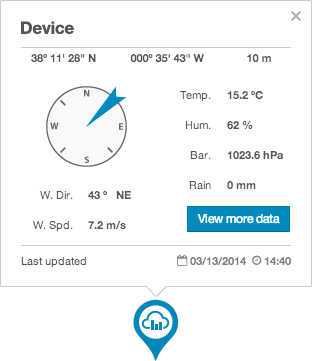 Dashboard: shows the advanced weather dashboard of that device (only enabled if the device owner has a Business plan. Learn more). Twitter: takes you to the Twitter account associated with that device (only enabled if the device is connected to Twitter. Learn more). Follow: lets you add or remove that device from your favorites list. 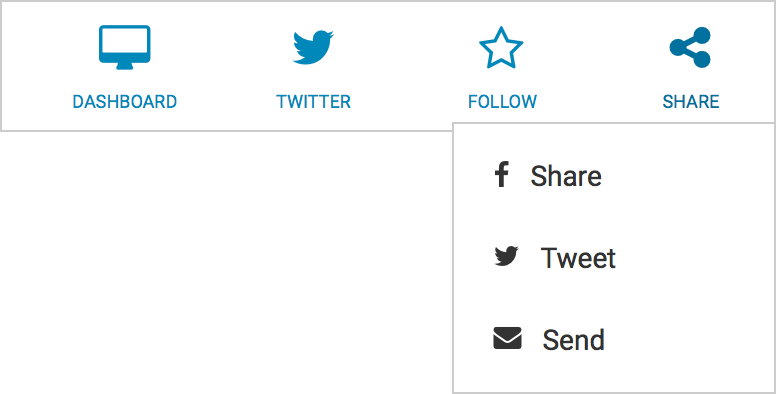 Share: lets you post the URL of that device either on Facebook or Twitter, or send it by email. 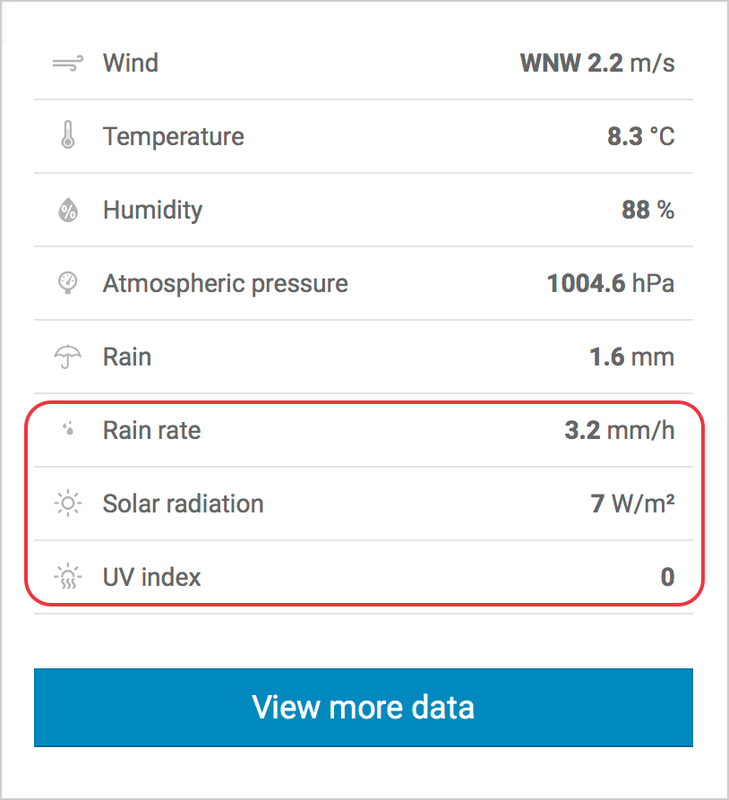 The new sidebox can display up to 9 different weather variables, including rain rate, solar radiation and UV index. If your device measures these parameters, you’ll now be able to check them directly from the map page. Ability to jump from one device to another by using the back and forward buttons of your Internet browser. This feature comes in handy for quickly navigating between previously viewed devices. Ability to zoom the map to your current area by just clicking on the new geolocation button in the lower right corner of the screen. Ability to link to the URL of a specific device on the map page. If you refresh the map page while viewing a device, a smooth transition will take you back to that device automatically. 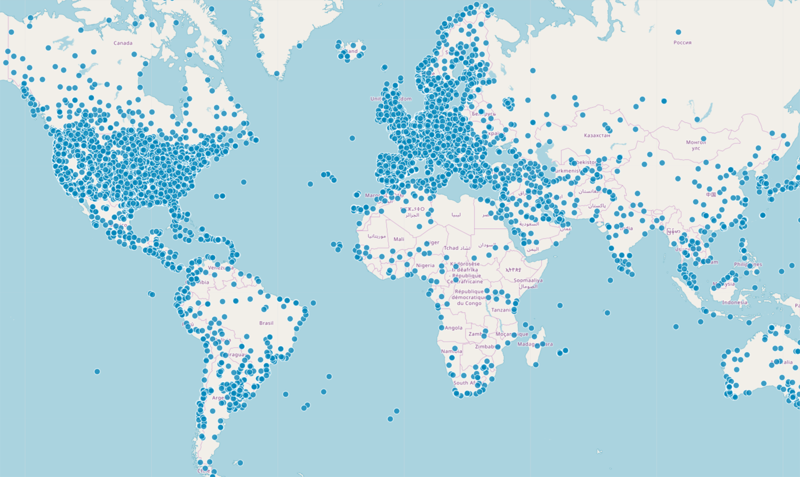 Added over 2,000 new METAR devices to the map. METAR devices now display visibility data. Added new Brand Assets page. Added compatibility with pywws software. Added compatibility with P100 and W100 stations from CCL Electronics. Added compatibility with 935PC and 975 stations from GARNI. That’s all for now guys! We hope you enjoy the new weather map as much as we do. And remember that your feedback is very important to us, so feel free to let us know your thoughts on Beta 7.